Mid May I received an e-mail out of the blue from the head honcho of the ‘Stadium himself , Svend “Dreadknux” Joscelyne. He asked if I’d be free to come down and write about the biggest birthday party of the summer. Some regular readers may remember my fleeting stint posting news and other things on the front page of the site and while I couldn’t hold a candle to the tireless efforts of Shadzter it seems I was somehow remembered by the boss. The plan was simple but purposely vague at the time; come down to London and write about the event as the regular staff would have their hands full running the thing. My reward was classified but Svend said it’d defiantly be worth my time. Not that I needed much persuading; I’d attended the first Summer of Sonic back in 2009 and wrote about it for a rather different Sonic based news website. I was eager to experience this latest event and the least I could do was help out however I could. If Svend wanted me to write then I’d jolly well write. I gladly accepted and waited for further orders. Almost a month later and Svend dropped the bombshell on me. My reward would be to help him interview Yuji Naka and Takashi Iizuka. Giddy? Excited? I was all those things. I counted the days down until the 25th of June like an excited child waiting for Christmas. When the time finally came I drove the 175 miles from Leeds to London at Super Sonic speed (That’s a lie, I’m a good boy and I mostly stuck to the 70mph speed limit). All this at 4am to make it to the venue in time for our 8.40am interview. Still in a delirious blur I stumbled passed the bouncers into the lobby towards an extremely busy looking Svend, the Camden Centre already a hive of activity. SEGA reps and Sonic Stadium members alike were hurrying to put together the finishing touches before the masses outside would be let in. 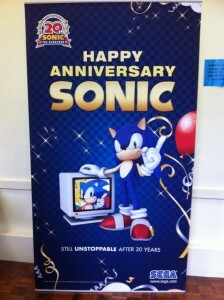 Within minutes we were ushered upstairs to a small room featuring several fancy white chairs a 360 demo pod and a Sonic 20th Anniversery banner. Oh and two of the men responsible for crafting games featuring the character I adore like no other. Svend and I sat opposite Naka-san and Iizuka-san while their translator sat to the side. I was still rubbing the sleep out of my eyes questioning the reality of the scenario I’d found myself in. This was real alright and within no time at all the questions began. As the interview progressed it was striking to note the differences between the two. Naka-san had come dressed in an expensive suit and jacket, his voice booming and authoritative. Yet in-between questions he’d casually pull out his iPhone (with Ferrari themed case, presumably to match his actual Ferrari back home) and text, some of the contents of which you can see here. Iizuka-san meanwhile had come dressed in a cool looking leather jacket and had a much more laid back demeanour. He’d occasionally chuckle at the questions before they were translated showing at least some understanding of what was being said. Both oozed confidence and charisma and both were obviously enthralled to be here. Svend Joscelyne: Thank you very much for your time. 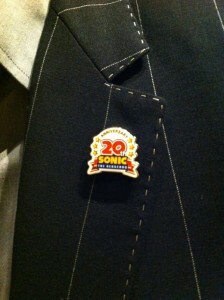 First of all, 20 years of Sonic! How does it feel to be part of a franchise that has endured for so long and to be sharing it with the fans today? 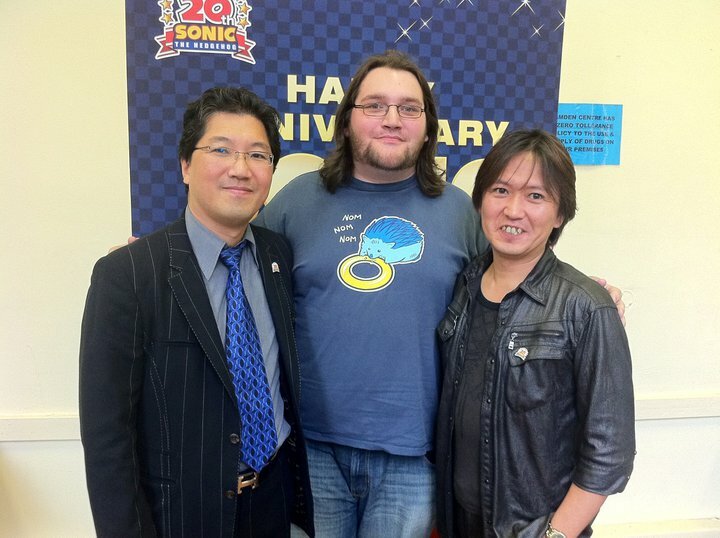 Yuji Naka: I’m just really happy to be here today. I’m honoured that the fans wanted me to be here and I’m really happy to be here to celebrate the 20th anniversary of Sonic and to see him still going after 20 years. I’m really grateful for the fans who have been supporting Sonic and have been watching us every time we release a new game. I was downstairs earlier watching people lining up for the event and I could see some old fans who have been supporting the franchise and the character for a long, long time. I’m just simply grateful for all the fans and their great support. He’s 20 years old right now but he’s still going and he’ll be still running at Sonic speed in the future. Takashi Iizuka: Naka-san has said pretty much everything so there isn’t a lot for me to say. 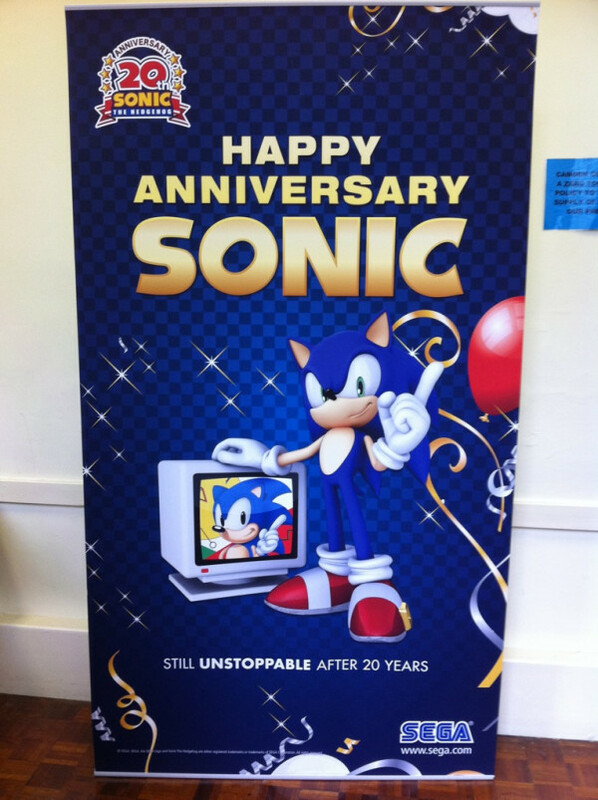 We were really grateful and we really wanted to show our appreciation to all the fans across the world at the time of Sonic’s 20th anniversary. I’ve been conscious of Summer of Sonic in the UK for a couple of years and it’s a really unique event. In the past we haven’t really done anything like this in the States or Japan so we tried to learn from the example of fans in the UK in celebrating all things Sonic. We recently did a big celebration event in the States and Japan this year to make it a big 20th anniversary celebration for Sonic. So we’re making this a global celebration to show our appreciation to the fans for their support. Paul Street: This question is for Naka-san. 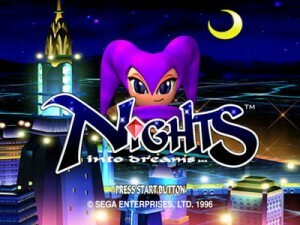 Back when the SEGA Saturn was released you went on to create NiGHTS and there ended up being no big Sonic game for that system. Were you worn out from making Sonic games and wanted to do something new or were there any technical limitations on the hardware preventing a Sonic game as he moves through the levels so quickly? YN: So at the time I’d been working on Sonic titles for some three to four years and in a way I wanted to take a little break and do something different. It was also around the time when I came back from the States so it felt like it was the right time for a change. We had the same guys who had been working on Sonic titles like Oshima who was the designer and Iizuka-san who was in the same team but we all wanted to do something new and that’s how NiGHTS came about. I still think it was a really good game and overall it was actually a really good thing for Sonic and us to do something different because when we came back to Sonic titles we were fresher and full of motivation. I was looking at the back catalogue of Sonic games yesterday and I realised there has been one Sonic title almost every year and that’s just incredible. SJ: During your time as the leaders of Sonic Team were there any points during the development of Sonic games where you had to cut something out? For example, stages from Sonic 2 or other things from Sonic Heroes or Sonic Adventure that you really wanted to keep in? YN: I’ve been pretty satisfied with the quality of the content of all the games I’ve created and I’ve done pretty much everything in them I wanted to when I started a project. But there is one thing, we were planning to implement in Sonic 2 called the Hidden Palace. We announced the name when we created the title but after we announced we had to give up on that content because of the lack of time to the release date. But because it was called Hidden Palace many users were convinced that it was somewhere. 10 years after the game came out there were still people saying “I’m still looking for it, where is it?”. I feel really sorry about that. Besides that exceptional case I’m pretty much happy with everything we’ve created. 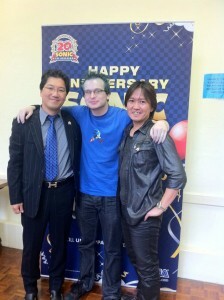 PS: This time for Iizuka-san. Some of the more recent Sonic games have been criticized for being rushed such as Sonic The Hedgehog for 360 and PS3 and more recently Sonic Unleashed. I was wondering what the internal pressure was like from within SEGA to release the games quickly? TI: As you can imagine Sonic titles are really important for both SEGA and their dev teams and because Sonic is loved by very different demographics from small kids to adults it can be difficult to make a game to please both. We have quite a lot of pressure to finish the product on time so we can hit the release date which is usually in time for Christmas. Particularly since our main platforms have moved to Xbox 360 and PS3 it takes quite a lot of time to polish games on these Next Gen consoles. But like with Sonic Unleashed and now Sonic Generations there is a lot of pressure to release on time. It’s usually around this time of year that we try to finalise the games and cram in time for the final checks so that the quality of the game is of a level that we can be happy with. SJ: This one is also for Iizuka-san. I remember at E3 you mentioned that in the future you wanted to try and bring the gameplay style of Classic Sonic and Modern Sonic together; not like in Generations where they are in the game separately but instead as a single game play style. Do you think that there is still work to be done to achieve that? A lot of fans thought that Sonic Colours was a step in the right direction. TI: In terms of the Modern Sonic 3D game mechanics Sonic Colours was a benchmark for us and we were really satisfied with how that game came out. It was pretty much at the level of what we imagined the new Modern Sonic action to be. So I think we will continue to make new 3D games in that direction. At the same time we understand we need to appeal to the classic 2D scrolling type of game so we will continue to experiment along that rout in Sonic 4 which we are still working on. SJ: Unfortunately we’ve only time for one more question and it’s for Naka-san. You were involved so heavily with Iizuka-san on Sonic Adventure which was Sonic’s first true leap to 3D, barring Sonic Jam of course. How difficult has it been to translate Sonic from a 2D space into a 3D space, keeping in mind the speed and the exploration. What challenges did Iizuka-san and you face with that? YN: Obviously the biggest challenge with Sonic was the change in dimension from 2D to 3D. In 3D we noticed it was really hard to get the grasp of the perspective and distance even if you used the same game play devices in 3D as the 2D game, for example spin jumping or spin dash. It was really hard to get the distance right so it was really challenging to create a smooth experience. But at the same time it was really fun and a good challenge for us. At the time the only kind of 3D game that was around was Mario 64, where you have a free roaming world in 3D and you can go anywhere you want to. The problem with that kind of game was it was really hard for the user to understand where they were supposed to go and what they were supposed to do in the big open world. It was really simple in the 2D scrolling games, you just keep pressing the direction pad right and you just eventually get somewhere. So we really wanted to include that sort of simplicity and sense of direction in the Sonic game. The result of the struggle was the 3D mechanics of the automatic camera switching that we had in Sonic Adventure as well as the modern Sonic games. I never got chance to thank Svend on the day as he and the rest of the team were a whirling-dervish of activity. The interview started late which had a knock on effect with everything else so I could only imagine the stress he was going through. I only hope that this story and the others to come in the next few days make up for giving me the opportunity to meet my idols. This isn’t the end though as I’ve so much more to write about. 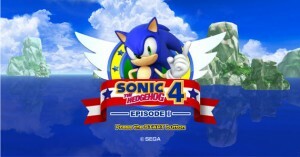 So stay tuned for the next part of the Summer of Sonic story coming soon to a computer near you. We have the transcript of the two part stage interview with the heads of Sonic Team and composer Jun Senoue, the Summer of Sonic experience as a fan, a Sonic Generations preview and anything else I can think to write about. Read, comment below and most of all enjoy being a Sonic fan because we’ve got it better now than ever.